Taylor Tashima sets the ball to Symone Abbott. The seniors have helped lead the Wildcats to a 10-2 start this season. 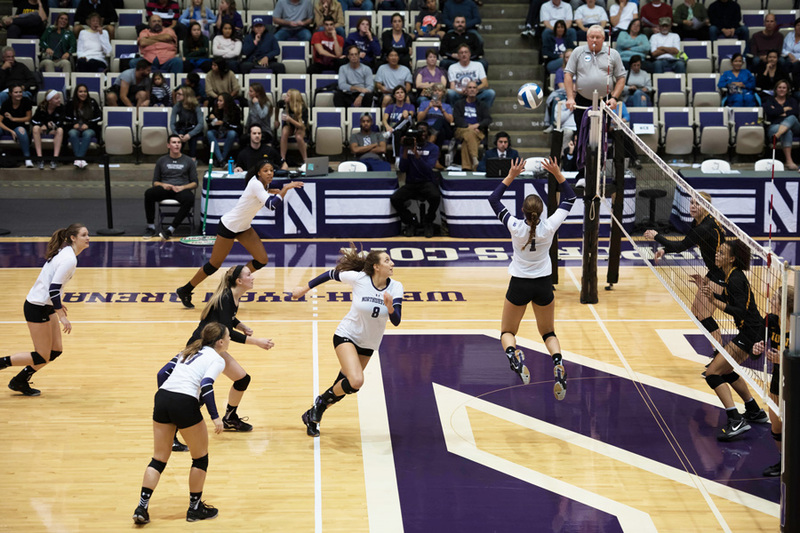 After a strong nonconference showing, Northwestern will open Big Ten play Tuesday on the road against No. 13 Purdue. The Boilermakers (10-1) will be the first tough test for Wildcats (10-2) as they attempt to navigate a Big Ten Conference that features six ranked teams, including the top two in Minnesota and Penn State. NU hopes to maintain its momentum from a nonconference slate that saw 10 wins, including nine consecutively. However, Purdue will enter the match as the No. 13 team in the country, ranked higher than any team the Cats have faced thus far this season. The Boilermakers will also be looking for revenge against NU, which earned its first conference win of the 2016 season against Purdue. The road environment will be another factor the Cats have to navigate when they arrive in the Boilermakers’ Holloway Gymnasium. Purdue is known for filling its gym with raucous crowds, and senior outside hitter Symone Abbott said she relishes the opportunity to play in such an atmosphere. While Abbott said she enjoys the thrill of playing on a big stage, she is one of just three seniors on a team that relies on numerous underclassmen who will make their first trip to West Lafayette. The challenge the Boilermakers present on the court extends beyond the crowd. Coach Shane Davis said Purdue has two outside hitters who can reach a towering 11 feet and are certain to provide a new type of challenge for NU. Most of all, Davis said the team is striving to be consistent through the gauntlet of Big Ten play after getting to know his players better during the successful nonconference campaign. “After the first 12 matches of the season we have a better idea of what we like as a staff and the players are a little more comfortable with who’s out there, so hopefully there will be better consistency as we go into the Big Ten season,” Davis said.